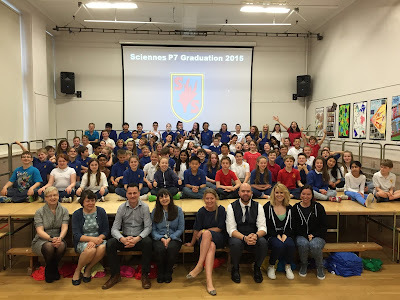 Sciennes Class of 2008: Stunning P7 Graduation Show 2015! What a stunning Graduation show on Monday 22nd June from our Magnificent Sevens! The pupils' confidence and joy in performing shone through and we were all so proud of them. Mr Howie, Ms Sellar, Mr McKenna and Mrs Barker worked as a close knit team to plan, rehearse and produce a remarkable show and we are grateful to Cat Perry, Director of Dance Division, and Vanessa Robertson for providing fantastic choreography. Thank you to Mrs Barker for all her musical input and accompaniment, to Mr Howie for technical wizardy and video editing and to Ms Sellar and Mr McKenna for tight direction and high production values. Thank you to former parent Lorna Irvine for superb input to the pupils' poetry - in her writing workshops and in polishing their performance. Photographs and video of the show will appear in due course. We also recognise and value the support of all the parents and carers who have worked with us throughout the last seven years. We pass on every best wish to all our families and hope to hear news of the pupils' continued success. Keep in touch! Robyn Spotted at the Museum!